Nintendo is prepping something of a fresh launch for last summer’s shooter, Splatoon 2. This new edition will pack in a few cool extras, but cost you the same as the vanilla version. 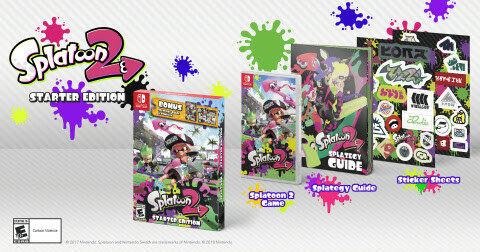 Has Splatoon 2 been a solid seller since it hit the Switch last July? It kind of has, with decent sale figures and a 20% attach rate. It hasn’t sold like gangbusters though, I don’t think anyone will argue that as titles like Breath of the Wild and Super Mario Odyssey have absolutely buried it at retail. So maybe it’s with that in mind that Nintendo has made today’s announcement. Maybe they’re thinking that a second run at a “launch” (with some pack-in goodies) will make for some added sales. It’s a good thought if that’s what it is. And I could definitely see it resulting in some purchases by fans who might’ve missed it the first time around. So what’s in this new pack? And what’s that cost? $59.99 USD, which is exactly the same as the game costs now, without any of the above. So if you haven’t bought into Splatoon 2 yet, maybe wait till March the 16th. That’s when this special Splatoon 2 Starter Edition lands at stores.